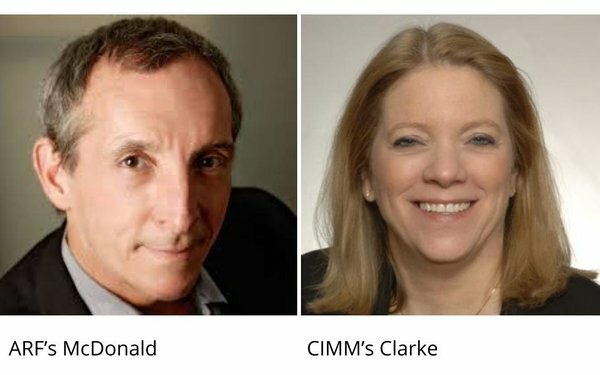 In yet another sign of industry trade consolidation, the Advertising Research Foundation (ARF) has acquired the Coalition for Innovative Media Measurement (CIMM), which will remain a free-standing unit focusing on the conception and development of tools to improve media measurement, as well as advertising research. The move follows some attrition in industry trade groups focused on measurement, including last year’s demise of the Nielsen-funded Council For Research Excellence (CRE), and the Association of National Advertisers (ANA) acquisition the Data & Marketing Association (DMA) earlier this year. ARF President-CEO Scott McDonald said the consolidation is a recognition that the organizations have been working on parallel paths and that it makes sense to integrate them under a single umbrella to better serve industry and member needs. The move also signals a broadening of the ARF’s mandate, which has diversified from its original charter of serving advertisers and agencies to serving the entire advertising, media and marketing ecosystem. Similarly, CIMM had been focused mainly on building partnerships between the supply and demand side of the media industry, and will now be able to work inside the ARF to develop new ideas, tools and applications that create innovation not just for measuring media, but for advertising overall, including potentially creative measurement methods. McDonald likened the role of CIMM inside the ARF to the one being played by the IAB Tech Lab inside the Interactive Advertising Bureau (IAB), and said the goal was to have a skunkworks unit that could develop, test and help bring new methods, models and technology to market. CIMM CEO and Managing Director Jane Clarke, who will maintain that role inside the ARF, said one of the advantages of the merger is that CIMM will shift from an LLC, which required members to be owners, to a non-profit, will enable it to broaden its membership to organizations that weren’t in a position to invest in an LLC. She also noted that by consolidating back-office and overhead functions within the ARF, CIMM will be able to focus more of its resources into developing products and services that facilitate better research and measurement.